When you see the traditional maize of Mexico for the first time you are stunned. It is a cornucopia of unimagined colours and lustre: blue black, purple, translucent beige, pearly white, some deep burgundy, sun-kissed yellow or crushed mulberry, and countless other combinations. Many of the variegated corn varieties appear to have been put together with a careful eye for dramatic effect. You wonder: are these real? Mexico is the centre of origin of maize, or corn, a place where it has been cultivated for several thousand years after it was domesticated from a grasslike tasselled plant, teosinte, in the southern part of the country. Some scientists say it has been cultivated for 7,000 years; others put it at 10,000 years. What no one doubts is its antiquity or place in Mexico’s culture and history. In times past, maize was regarded as a deity; in some cultures it was believed that gods created humans out of maize, as in the Popol Vuh, the sacred book of the ancient Mayans. Historians think that such a belief holds more than a grain of truth because it was the cultivation of maize that transformed the early Mayans from hunter-gatherers into a settled and highly advanced civilisation. And it was not just the Mayans. 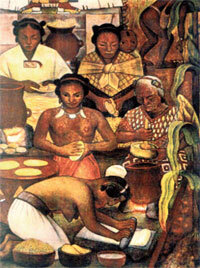 Maize was cultivated by other pre- Hispanic populations: the Aztecs, the Zoques and Mixtecos among others. In more modern times, it is the campesino who has been nurturing the traditional maize for centuries. Campesino is defined as a resource-poor farmer, cultivating mostly in rainfed land by traditional methods for self-consumption or for the small market. This system of cultivation called milpa was till recently the backbone of the rural economy. In a milpa, maize and about two dozen associated cultivars, ranging from melon, tomatoes, sweet potato to a wide variety of squash and beans are sown together. The reason is simple: some of the plants lack nutrients, while others have it in abundance, resulting in a selfsustaining symbiosis. But in the 21st century of food shortages and technological assaults on traditional agriculture, does the milpa and Mexico’s treasure trove of maize count for anything? A lot of people think it does—or should. Scientists, anthropologists, academics, the small farmer and environmental activists believe that such biodiversity must be preserved at all costs. 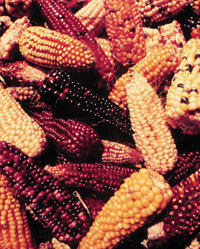 In all, Mexico boasts 59 maize landraces (local plant species that have developed largely by natural processes and are specific to a region) and hundreds of varieties. Since the 1990s, the Mexicans have been engaged in a struggle to keep genetically modified (GM) maize out of the country because they fear the country’s unique and irreplaceable genetic heritage would be contaminated by the seeds that multinationals like Monsanto and DuPont’s Pioneer Hi-Bred International (PHI) wish to introduce. Their worry is the gene flow from transgenic maize. In fact, there was a ruckus when traces of transgenic maize were detected in rural areas in 2001. It was first reported by Nature in Septem ber 2001, and although the journal qui ckly withdrew the report, it was confirmed by the Mexican government in April 2002. A staunch defender of biodiversity is Elena Lazos Chavero, a biologist and anthropologist whose research centres on rural livelihoods and the impact of biotechnology on agriculture. She is passionate about conservation of traditional maize as a common asset, and at a recent international conference in In dia, she made participants sit up with her delineation of her country’s maize saga. You cannot talk maize with a Mexican without provoking strong emotions. Maize production accounts for over two-thirds of the gross value of agricultural production, covering half the total area under cultivation. It employs roughly three million people, or over 40 per cent of the agricultural labour force. And unlike in the US and other industrialised countries, 68 per cent of the maize is consumed directly used as food, primarily in its trademark tortilla. Bt maize was first introduced in Mexico in 1996 but in the face of resistance from peasant organisations and environmentalists it was kept on hold, with the Mexican government declaring a moratorium that lasted 11 years till 2009. In April 2010, however, the government decided farmers should be given access to new technology and it granted 67 permits for companies to grow GM maize on an experimental basis, prior to the pilot phase. The permits covered more than 70 hectares in the north of the country. How did this happen despite a strong movement against GM? It was a serious setback for the conservationists. “An appeal signed by 600 scientists in November 2009 was ignored and so were important social movements of 130 peasant organisations. Besides, 15 states objected to the permission given to the multinationals,” recalls Chavero, professor at the Social Sciences Institute of UNAM (Universidad Nacional Autónoma de México). 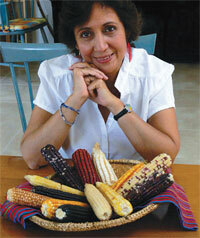 The challenges for conserving Mexico’s maize are immense. On the one hand is the pressure from the MNCs. “It’s a clear political-economic alliance in which the seed companies, grain buyer and the buyer are involved. Large farmers are offered a technical package complete with credit, and assured markets,” points out the academic-activist. On the other hand, are the government’s own policies which have punished the small farmer by cutting all subsidies and credit in the past two decades. 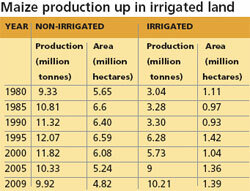 Almost all the irrigated land (see chart) is in the hands of medium and large landowners and these are sown with hybrids and new high-yielding varieties Only small irrigated plots are cultivated with native maize. Compounding the problems is the North American Free Trade Agreement (Nafta) that binds Mexico in an unfair pact with the US and Cana da. Says Chavero: “Our earlier president Vincent Fox used to say the poor do not contribute to our GDP because they are not productive. So we export cheap labour to the US and import cheap food from the US.” But cheap corn imports from the US (hugely subsidised) have only worsened the crisis, with vast numbers of peasants migrating to the northern cities and to the US as illegal workers. Associated with this migration are other disturbing phenomena. Tracts of land abandoned by the campesino are grabbed by big landowners, (through renting); the ageing of rural communities because the young no longer stay with farming; disappearance of governmental institutions that regulated the marketing, the storage and the distribution of maize and also those institutions that produced ameliorated seeds based on the native maize. All this has roused the people into forming ‘Sin maíz no hay país’ (Without maize, there is no country), a national campaign that has banded together different interest groups to fight for their treasured maize. Yet, in March this year, the government gave permission for the first pilot project (Monsanto’s) to grow GM maize on a one-hectare plot. Two other applicants are in line. Victory or defeat? Some conservationists believe it is a success in some ways since the pilot is restricted to a small plot. Also, the Mexican government is expected to take quite a while to evaluate the economic benefits. This is the second phase before commercial cultivation is permitted. In this are lessons for India. MNCs are getting ready to unleash their GM maize in the country and tests are being conducted, some of them clandestinely. Even India has some traditional maize varieties that the tribal people are partial to. These, too, need to be conserved. All the native verieties of corn are getting lost in India even.This is because they have introduced corn hybrids. These seeds which they are selling to we farmers are nothing but the terminator added. They can transfer this terminator gene through cross pollination to local fileds of corns, to a long distance and killing the local seeds for ever . They have used the same technique for most of the crops and finished the biodiversity of crops on indian terain for ever.They say that hybrids are for single use so you have to bye the new seeds every year. But it's not true. If the hybrids are produced from traditional beeding technics then you will not kill your neighbour's feilds.as well ieven if you use f2 of such hybrids the plants will be fertile ,only segragation will be there. But no harm to anybody. But if the hybrids are using male sterile female then the f2 seeds of such hybrids are 100 % sterile which will compel farmers to purchase seeds every year.